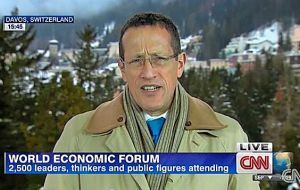 Richard Quest (56) is probably the most experienced aviation journalist around today. A Liverpudlian, and called to the Bar, he joined the BBC as a trainee reporter in 1985, moving to New York in 1989 to become the North American business correspondent. He joined CNN in 2001 and continues to present a variety of programmes mainly related to commerce and air travel. He has written two books on MH370. This SOAPBOX was published in The Daily Telegraph on 10 September 2018. "British Airways is still one of the world’s great airlines. The problem is, it’s not as great as it once was but it could be again. It does not have the bling or largesse of Emirates or Qatar (ironically one of its major shareholders); it doesn’t have the clean purposeful crispness of Lufthansa; the uber-perfectionist mentality of Singapore Airlines, nor the profitability of the US carriers, which have been able to spend to improve both reputation and product. The truth is everything and nothing. Firstly, we need to disregard the irrational: in the UK it’s a national pastime to bash BA. At any cocktail party or business meeting, when the conversation turns to travel or airlines, there’ll be a great deal of head-shaking and tut-tutting about ‘the state of BA’. Older passengers moan that BA has never been the same since it stopped serving beef off the trolley and soup from the tureen in First Class. Decades after being privatised, BA is still viewed, quite rightly, as the national flag carrier because, as you can see from the tail, it carries the flag. The airline is a British institution and its CEO is a target – somewhere between the Archbishop of Canterbury and the Director General of the BBC – fair game and fodder to be beaten up for problems and issues way out of his control or business. Instead, I intend to argue that things are not as bad as everyone says. The airline is changing in major ways, the problem is that change is far too slow for passengers’ liking. Let’s look at the facts through the prism of hard and soft product. Take the hard product – the plane, the seat, the infrastructure. BA has bought new planes; lots of them. A380s, 777-300s, Dreamliners, and is soon to add the A350, and there are dozens to arrive. But like every airline, it still has loads of old aircraft in its fleet – for instance the 36 Boeing 747-400s, which are slowly being phased out, but whose cabins are well past their prime. They are often scuffed, even dirty. Then there’s the seat: BA pioneered the flat-bed seat in business more than 20 years ago. They did so with a bespoke product – facing seats with a strange fan as a divider. That seat and its variants has been the backbone of Club ever since. It is an enormously profitable arrangement, allowing BA to get 8 abreast on a 777, compared to 6 on most other carriers, which have installed newer, roomier seats. It’s one reason why BA’s owner IAG ranks just behind the US carriers as the world’s most profitable airline group. But offering all-aisle access is now the gold standard in business. Even American, United and Delta have reconfigured their planes to get rid of the middle seat. BA is believed to be working on delivering this with a new business class, but it hasn’t been seen yet and, even when it is ready will take years to roll out across the fleet. When flying London to New York many passengers choose to fly American Airlines metal through the BA/AA code share, because American’s seat/bed is bigger, roomier and more private. Staying with infrastructure: last year’s massive power failure that crippled the airline, alongside repeated baggage failures and now this huge IT hack are arguably evidence that investment has been lacking in the ground hard product too. In its defence, the reasons behind the hack are not yet known, and frankly so many businesses have been hit by similar attacks, so BA may simply have been unlucky. Even when they do offer a new product, BA manages to trip over its own shoelaces. The airline recently introduced new bedding from the White Company. It comes in a box, which is on the seat when you board. That’s the problem – safety requires it be stowed for take-off – with full overhead bins, it is almost comical watching passengers and staff wondering where to shove the box. Then there’s the new food service in Business. It is very good, tasty and plenty of it. But the airline has created a monster because delivering this new service is complicated and fiddly and takes ages, leaving the passengers wondering, where’s dinner? Which brings me to the soft product – the staff and the service. Here too, BA has managed to enrage passengers, this time at the back of the plane. Getting rid of free food, making you pay for drinks – even coffee – in short-haul economy was a well-aimed bullet to both feet. It spoke of a low-cost, not quality carrier. When competitors like Lufthansa and Air France still offer a free cup of coffee it just makes BA look stingy. Years of industrial strife have taken their toll, leaving its workforce disgruntled. It’s hard to offer top-notch service when your crew is resentful about its employer, constantly grumbling about how they are being treated through changes in staffing, or cuts in pensions and benefits. The list of grumbles is long. BA cabin attendants have told me time and again, they want to do a great job, but they feel the airline isn’t giving them the respect or tools necessary to do it. On the other hand, some older staff hanker back to the glory days, forgetting BA is in a brutal war often requiring radical change. It’s pretty difficult to be world class when staff and management constantly disagree. I promised that I would be dispassionate, so it is worth remembering the following about some of BA’s closest competitors, none of which are that great either. Air France is a mess – with seemingly little strategic direction. Lufthansa has been beset by strikes, Ryanair has a terrible reputation for service, Alitalia is bankrupt. Iberia (BA’s stablemate) has quality issues too. British Airways makes 60 per cent of parent company IAG’s revenues, and 80 per cent of its profits. It’s the very big brother of its siblings, Iberia, Aer Lingus, Vueling and now Level, so getting BA back on track isn’t something optional for either the airline CEO, Alex Cruz, or his boss Willie Walsh, it’s vital. Cruz has made a start. But IAG is going to have to allow much more investment in hard AND soft product. It also requires the airline to come out of denial and recognise, whilst it’s still top tier, it has slipped and is continuing to fall. In the end, BA, like other British institutions, reflects the mood of the nation. As Brexit causes a crisis of confidence in “being British”, so the national airline inevitably becomes a lightning rod for worries about the UK’s future. Inside BA they will tell you, when the British mood is high, the airline is beloved, when the mood sours, BA represents all that is wrong and is kicked. For decades BA innovated. The first flat bed, premium economy, arrivals lounges, help yourself snacks. Putting things right won’t be easy, but with strong vision, proper investment and grim determination to do whatever it takes, BA can prove it is truly great once again". In the opinion of Richard Quest, one of my favorite television commentators: ‘British Airways is still one of the world’s great airlines. The problem is it’s not as great as it once was, but it could be again’. Well…BA was one of the world’s greatest airlines. It is still today? Definitely not. Will it be great again? I doubt it.British Airways has now joined the ranks of the gray and mediocre carriers, the ones that ambush passengers at every click while making a reservation with absurd fees and extra charges, the ones that want to charge passengers more and more money and want to give less and less service and comfort. BA’s philosophy is no different than any of the ‘low cost, low quality’ airlines that are operating today while still pretending to be ‘the world’s favorite airline. But maybe BA have now slid too low into the valley of mediocrity that the way back up to the top may be too steep of a climb. It is difficult to have any sympathy for an airline that blatantly breaks the law! Customers must be reimbursed within 7 days, yet 8 weeks later I am still waiting, also they incorrectly interpreted the law! Needless to say their version benefits BA! Staff openly lie and mislead passengers! Their is simply no excuse! !